WATERVILLE -- A fresh blanket of snow Friday curtailed a "large-scale search" for missing 20-month-old Ayla Reynolds, according to a news release from the Waterville Police Department. WATERVILLE — A fresh blanket of snow Friday curtailed a “large-scale search” for missing 20-month-old Ayla Reynolds, according to a news release from the Waterville Police Department. The Maine Warden Service would conduct searches as necessary, according to the release. 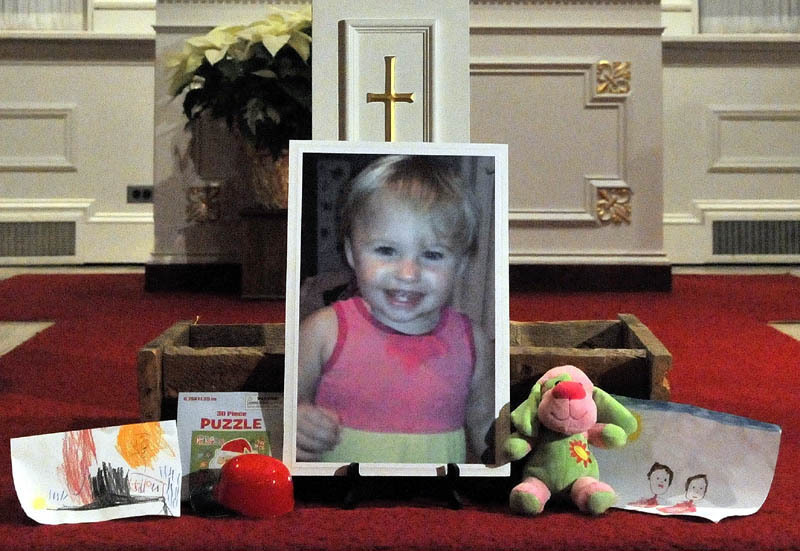 A photo of missing 20-month-old Ayla Reynolds sits on the altar at the First Congregational Church in Waterville during the "Vigil Of Hope For Ayla Reynolds" Wednesday night. Dave Martin, president of Dirigo Search and Rescue, one of 15 volunteer groups affiliated with the Maine Association of Search and Rescue, said he packed up his trailer and left Waterville on Thursday night. He said wardens met with volunteers at 5 p.m. Thursday to say that they were planning to search smaller geographical areas the next morning. Also on Friday, Waterville police chief Joseph Massey announced that a news conference scheduled for 2 p.m. was canceled. News conferences had been a daily occurrence since Sunday. The grandmother of the missing toddler, Becca Hanson of Portland, said she receives all of her information on the investigation through the news. “We haven’t heard one thing from the police,” she said during a phone interview Friday. Hanson said she has theories as to what happened to her granddaughter, but she’s not sharing them. “They’re all mine, so I’m going to keep them to myself for now,” she said. During a Thursday news conference, Massey said investigators had received about 200 leads in the case, which began a week ago today when Ayla was reported missing by her father, Justin DiPietro. The state’s top homicide prosecutor, William Stokes, visited the 29 Violette Ave. home Thursday. A Maine State Police trooper cordoned off the home with yellow crime scene tape a short time later. Stokes is the chief of the attorney general’s criminal division, which includes the state’s homicide unit. Massey said at the news conference later that day that the increased activity at the home where Ayla was last seen was a routine step in the search for clues. “Don’t read any more into it,” he said. Earlier in the week, searchers drained parts of Messalonskee Stream and a pond on First Rangeway. They also conducted house-to-house searches of unattached garages and sheds. On Monday morning, DiPietro declined an interview. On Tuesday night, DiPietro released a statement to the media through the Waterville police. “I will not make accusations or insinuations towards anyone until the police have been able to prove who is responsible for this,” he said. Ayla was last seen wearing green one-piece pajamas with polka dots and the words “Daddy’s Princess” on them. She is 2 feet, 9 inches tall and weighs about 30 pounds. Her arm is in a soft splint.